Construct the midpoint for one of the sides of the triangle by pressing the "midpoint" button then clicking on the side for which you want a midpoint. Then rotate the triangle about that midpoint by clicking the "rotate about point" button, clicking the triangle you want to rotate, clicking the midpoint around which you want to rotate the triangle, and entering the letter name of the next unused slider (if it is your first rotation, enter "a"). Then, after clicking the "cursor" tool, drag the slider you just entered to see your triangle rotate. 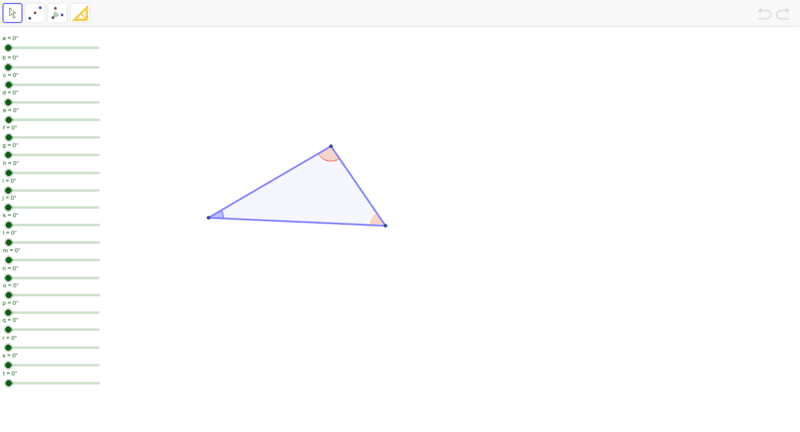 Label and color the angles of your new triangle using the "angle" tool by clicking the three vertices of the triangle. The first point you click will have a blue angle label, the second you click will have a red angle label, and the third will have a yellow angle label. Repeat this process to answer the questions at the bottom of this page. 1. Display a sequence of triangles to illustrate that alternate interior angles formed by parallel lines cut by a transversal are congruent. 2. Display a sequence of triangles so that the perimeter of the final figure is a pentagon, then use the display to determine the sum of the interior angles of the pentagon.